Tharn was defeated by the Eternal Champion, who infiltrated the Imperial Palace with a recreated Staff of Chaos and used it to drain the Jewel's power. Tharn, who had placed his life force in the Jewel, was destroyed, and Uriel VII was returned to Tamriel. It is unknown what became of the Jewel of Fire. 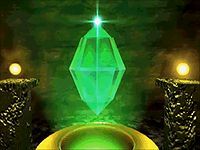 The Jewel's origins and ability to hold magical energy are similar to that of items made from Meteoric Glass, a type of Aetherial Fragment. This page was last modified on 14 January 2014, at 17:42.